In this guide you can find information on how to connect to an IP camera with your Windows Forms/WPF Application written in C# and take a snapshot in JPG file format. To implement this example, you need to have OZEKI Camera SDK installed, and a reference to OzekiSDK.dll should be added to your Visual Studio project. How to take a picture snapshot using C#? button_SaveTo_Click(): makes the user be able to choose the path and saves the result into the TextBox GUI element that can be seen on the picture below. Btn_Snapshot_Click(): initializes the path variable that is used to determine the destination folder of the captured picture. Then calls the CreateSnapShot() method with this parameter. 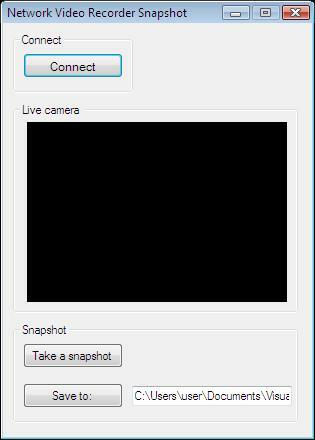 _connector.Connect(_camera.VideoChannel, _snapshotHandler): you need to connect the video channel of your camera to the snapshot handler. If the TextBox GUI element is empty, there will not be a path where we could save the captured video then we have to save it to the source folder where the application has been started.